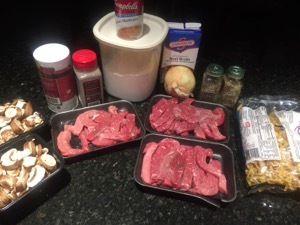 Here is a quick one for you…..well….it may take a while to cook being in the slow cooker, but it won’t take you much time to prepare. The tender, savory beef is just awesome! 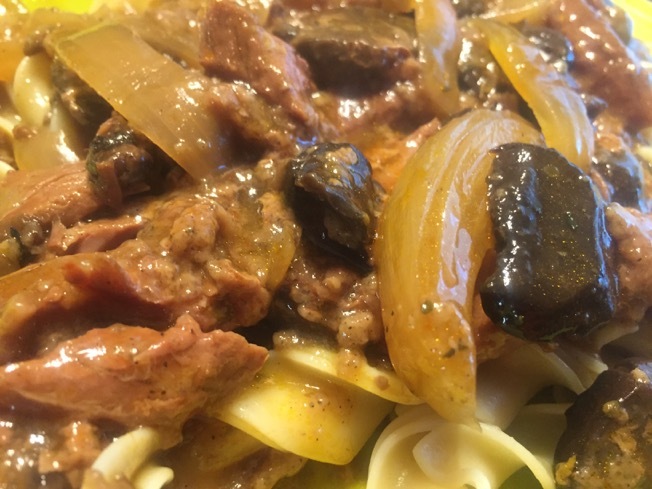 Pre-cut mushrooms and pre-sliced beef makes this so easy. 1. In a large resealable plastic bag, combine the flour, salt and 1/4 teaspoon pepper. Add beef, a few pieces at a time, and shake to coat. 2. In a 3-qt. 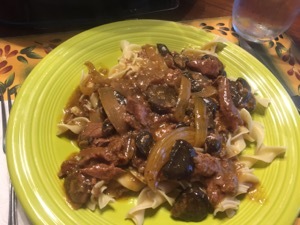 slow cooker combine the mushrooms, onion and beef. Combine the soup, sherry, oregano, thyme and remaining pepper; pour over top. Cover and cook on low for 7-9 hours or until beef is tender. Serve with noodles. Yield: 6 servings. Nutritional Info: 3/4 cup (calculated without noodles) equals 265 calories, 6 g fat (2 g saturated fat), 87 mg cholesterol, 612 mg sodium, 12 g carbohydrate, 1 g fiber, 36 g protein. Diabetic Exchanges: 5 lean meat, 1 starch. I love a good slow cooker meal! Pinning this to make for my family. Sounds yummy! Never thought to try the thyme and oregano together in this. Will have to give it a shot.